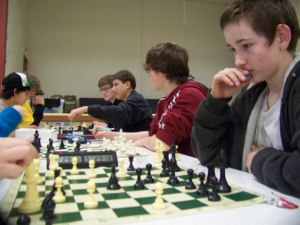 The fourth and final round of the Southern Oregon Chess League played Saturday in Myrtle Creek with Coquille Varsity and Coquille Junior Varsity leaving the rest of the teams in the dust to win the overall first place championships for the League. Over the 3 months of Saturday games, Coquille Varsity won 11 out of 12 games and Coquille Junior Varsity was undefeated in their 12 games. A tough, new team from Myrtle Point in action. Myrtle Point is a new school with a new chess club that started in November, but their Junior Varsity team placed second against the more experienced schools of Oakland, Sutherlin and Myrtle Creek. Sutherlin, Oakland and Myrtle Creek had problems fielding full teams for the Saturday tournaments, but the team members who did attend played some exciting games. Coquille had plenty of kids who want to be on their state team so extras tagged along and were fillers for the teams that were short and even made up an “ad hoc” teams so no team byes were needed. Amazingly (and miraculously for all four Chess League events), the extras made up the exact shortages so there was never a bye and every player had an opponent each round! 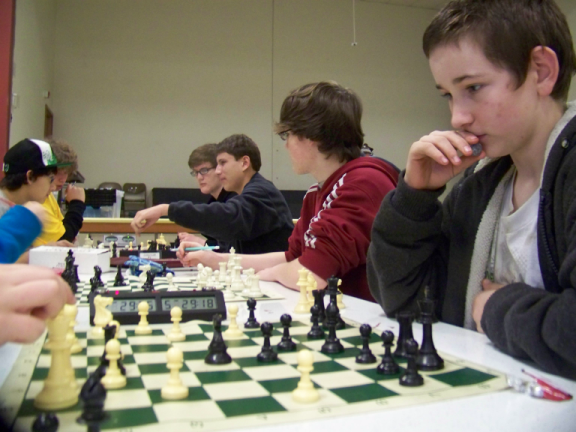 A “Medford” team was invited and attended the last two rounds of the Southern Oregon Chess League. They were made up of homeschool players from Medford, Central Point and Grants Pass. The coaches were more interested in providing challenging and exciting chess play and invited the Medford team to play. They were the only team to give Coquille Varsity team their single defeat during the 12 game League. The Chess League has provided Medford quite a bit of challenge and fun but state rules will not allow them to participate in the State Championship because their players are not all from the same school attendance area. But now the Medford group is hoping to recruit players and meet the qualifications for next year! They placed second for the Varsity division. Oakland’s Jeff Miller put in a strong game against Marshfield’s highly rated (and last years Coos Curry Regional Champion) resulting in a draw. Coquille’s Jessi Ross won nearly all her games but losing only to Medford’s Collin Goldman in the final round despite beating him the previous month. Myrtle Creek’s Aaron Opp beat out Myrtle Point’s stong first board Shiloh Trigg and Oakland’s first board Iza Cowie. Player development is proceeding rapidly in the southern part of the state, and the State Championships will need to keep an eye on these rural players from down South.